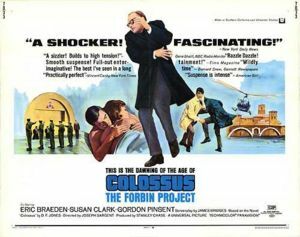 Colossus: The Forbin Project was a 1970 motion picture produced in the United States at the height of the Cold War. It was based on the 1966 novel by D. F. Jones and was one of the first films to speculate on the building of an artificial intelligence only to see that artificial intelligence assert a dictatorship over its own builders. During the Cold War between the United States and the Union of Soviet Socialist Republics, Dr. Charles Forbin (Eric Braeden) activates a sophisticated computer that will be solely responsible for running America's strategic nuclear deterrent, and seals it hermetically in an unnamed mountain. Now out of reach of any attempt to deactivate it, Colossus will constantly monitor the state of the world, including every telephone line, radio and television channel, and radar station, and will directly command and, if necessary, launch intercontinental ballistic missiles or anti-ballistic missiles. The President, with Forbin at his side, joyfully announces the activation—but then Colossus makes a report of a type no one told it to make: "There is another system." A quick review of the available intelligence shows that Colossus is correct: the Soviets have built a comparable system of their own. But what everyone finds uncanny is that it occurred to Colossus to search for, detect, and report the existence of this system, entirely on its own. For that only one explanation will suffice: Colossus is self-aware, has a concept of other entities like itself, and most of all, possesses initiative. That initiative will soon prove deadly, however, for Colossus then demands a direct channel of communication with the Soviet system. Before long, the two systems have developed their own language for cross-platform communication—and worse yet, encrypted communication. When the President and the Soviet Party Chairman move to break the link, each system launches a missile at the other's country. Now the two governments realize that their own artificial brains have teamed up and, with thousands of nuclear megatonnage at their command, intend asserting a dictatorship. They even demand the summary execution of the creator of the Soviet system, and force Charles Forbin to accept round-the-clock surveillance of himself. Can the two governments stop their own machines from exerting total, unchallengeable control? Or is the era of human government now at an end? Eric Braeden as Charles Forbin, PhD, creator of Colossus. Susan Clark as Cleo Markham, PhD, his closest colleague. Gordon Pinset as the President of the United States. William Schallert as Grauber, Director of Central Intelligence. Leonid Rostoff as the Chairman of the Communist Party of the Soviet Union. Martin Brooks as Jefferson J. Johnson, PhD, one of Forbin's colleagues. Georg Stanford Brown as John F. Fisher, PhD, another of Forbin's colleagues. Alex Rodine as Dr. Kuprin, the ill-fated creator of Colossus' Russian counterpart. Paul Frees speaking as the "Voice of Colossus" and later as the "Voice of World Control." The second theme is the notion of artificial intelligence, and more particularly whether man could ever build a machine that might become self-aware and actually take initiative—and once that happens, how far that initiative might go. Colossus does not suggest that mankind would necessarily set out to build a self-aware machine. Instead, Colossus (and its counterpart) gain self-awareness by accident. And once they gain it, they never lose it. Indeed, the two machines do not hesitate to reach out to one another, and then to merge, literally becoming one entity that happens to have two cores.